We just did that last July… added a pot of Variegated Crinum to brighten our courtyard that desperately needed a life saver. This plant stands out remarkably well where green abounds! It was love at first sight when I saw this large-leaved beauty at a nearby garden centre recently. 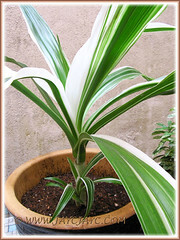 The purity of the white bands on its green foliage is simply attractive, to say the least. 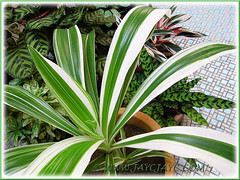 I was terribly fascinated with the leaves variegation… so beautiful, none of the leaf blades are patterned alike. 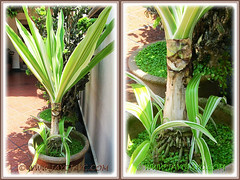 We had purchased it for a steal… just RM15 for a medium-sized plant with two pups that made it all the more worthwhile. I was giddy with delight, foreseeing the pups being eventually separated and grown individually as new plants. How wonderful… more plants, thus more pups to perpetuate its dramatic existence in our garden, indefinitely! Besides, they’ll be great as gifts to friends and neighbours. It was a breeze nailing this plant’s ID. Somehow its structure and form reminded me of the Grand Crinum Lily with totally green leaves that I’ve written about previously. Simply googling for ‘variegated crinum lily’ and viola… the results were spot-on! This spectacular Variegated Grand Crinum Lily will surely be a hot favourite among landscapers and home-gardeners alike. 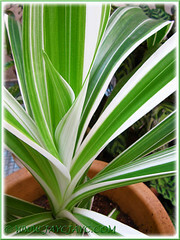 Its enormous size and captivating foliage that is heavily striped in green and white, plus showy flowers will certainly make a showpiece specimen in any landscape or garden. Common Name: Variegated Crinum, Variegated Grand Crinum Lily, Variegated Giant Spider Lily, Striped Bengal Lily, Asiatic Poison Bulb. Origin: Native to tropical Africa, Asia and Southeast Asia, Indian and Western Pacific Ocean coastlines, and Australia. Also cultivated elsewhere. 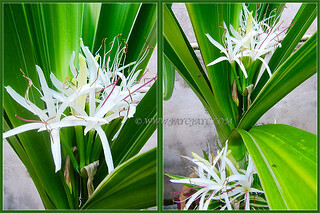 Features: Crinum asiaticum ‘Variegatum’ is a variegated cultivar of the species, ‘asiaticum’ belonging to the genus, Crinum, that comprises of 60 – 100 species. In the wild, the native species with typical green foliage can be found growing along coastlines or sandy seashores and in mangrove swamps. In optimum growing conditions, this evergreen herbaceous perennial that is moderate to fast-growing, can reach 1.5 m (5 ft) tall and form clumps that spread to about 2 m (7 ft) wide. Spectacular and impressive, the cultivar ‘Variegatum’ produces large strap-shaped leaves that are up to 1 m (3 ft) long, 10-15 cm (4-6 ins) wide, tapering gradually to a point, simple and have slightly undulated margins. 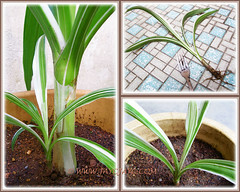 The smooth-textured leaves are prominently variegated with green and white stripes and emerge from a bulb that grows larger as it matures and may weigh up to 9 kg (20 lbs). Leaves are spirally arranged on an erect and thickened pseudostem made up of sheathing leaf bases. The Variegated Crinum Lily multiplies readily by producing pups prolifically. Besides, it flowers intermittently throughout the year in the tropics and non-frost regions. An erect, solid and succulent flowering scape will emerge from the axils of old leaves and topped by a cluster or umbel of about 20 – 50 large blooms, showcasing a huge flower head. Pure white lily-shaped flowers are held on greenish tube-like pedicels with a flared crown of narrowly lobed petals and very thin filaments. The sweetly scented flowers are short-lived but the whole flowering process is wonderfully prolonged as the numerous buds gradually unfurl over an extended period of time. 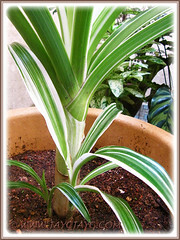 Culture (Care): Variegated Crinum asiaticum is an easy to grow bulbous plant that requires little care. Light: Grow best in full sun and tolerates partial shade. It enjoys lots of light and heat, so do not site it in shade or deep shade. Soil: Any kind of well-drained soil, though best in humus enriched soil. It is salt tolerant. Others: Remove withered or yellow basal leaves as they age, and spent flowers too, to keep it aesthetically appealing and encourage new growth. Feed monthly with a balanced fertilizer. 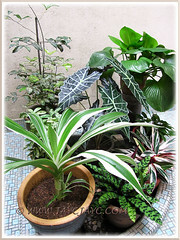 Repot in a large pot when necessary to provide sufficient space for the plant to grow well. No serious insect or disease problems though occasionally bothered by snails, caterpillars and leaf spot. Beware that all parts of the Variegated Giant Crinum Lily are poisonous and may cause severe discomfort if ingested, and the sap can cause skin irritation or allergic reaction. Propagation: By separation of offsets or pups from the parent plant and by seeds that should be sown soon after ripening, the former being preferred as seeds take about 30 days to germinate and a much longer period to reach flowering size. To ensure success, remove the pup when it’s neither too tiny nor too large. Dig in around it carefully with a garden spade or fork as deep as you would think the roots are situated, and gently pull it out together with its bulb and roots. 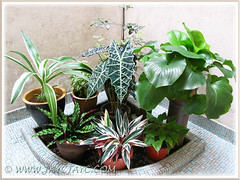 Then, pot it in garden soil, water thoroughly through and site it at a semi-shaded area to acclimatize. Usage: Crinum asiaticum ‘Variegatum’ is mostly grown for its spectacular variegated foliage and showy flowers, enormous size and sculptural form – will make excellent landscape plant at parks, gardens and other public places. Grow it as an interesting specimen plant in home gardens for that dramatic accent or en masse in borders or use it as bedding plants or informal hedge to line the fence. Great as container plant or grown in raised planters and suitable too to be grown as aquatics or semi-aquatic plants. Ideal in greenhouse for year long blooming in temperate regions. Hello !! It is a very beautiful variegated Crinum in our garden but we have one green leaf and has been slow to bloom. Respect and affection for you. Yara… thank you for your kind thoughts. I understand that the green variety is a better bloomer than my variegated one. Hope yours bloom soonest for you and continue for many more seasons to come. Have a lovely day and rest of the week, my friend. Overwatering causes bulb to rot? I had accidentally put this plant standing in water as I had no more pots and so I placed it in a container but there was no water holes in it. It stayed there for weeks and few months. Then I realised that this one can handle wet feet. Currently I had given away this plant to all of my friends who wanted some aquatic plants. If you could – see if you can try it with the pups. Just my point of view – see if I’m wrong or whether it is something to discover – that this one can stand on water. Thanks for your feedback and sharing, James. Yes, I’m aware that it can be suitably grown as an aquatic plant as mentioned by a commenter at Dave’s Garden, link provided in my article above. In my humble opinion, growing plants in soil is entirely different from growing in water. Surely, they have different requirements… it does not mean that being an aquatic plant, it will survive as well in soil that is heavily overwatered. What could be the reason for Crinium lily leaves having brown areas?